After trading initially in the red in the first half of the session and with modest gains after than on Friday, the Indian Equity Markets saw a sharp upsurge in the last hour of the trade. The benchmark Index NIFTY50 saw a sharp up move and finally ended the day gaining 80.75 points or 0.75%. This was mainly led by short covering as the NIFTY futures ended with premium and with shedding of net Open Interest. 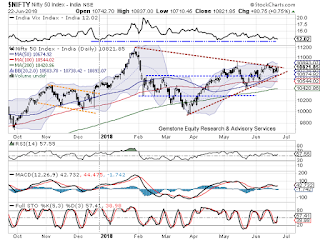 As we approach Monday and also the beginning of the expiry week of the current derivative series, the opening levels and the behavior of the NIFTY vis-à-vis the level of 10850 continues to remain very critically important. Sooner the NIFTY moves past this level, larger will be the chances of a sustainable up move in coming days. Any drift or failure to move past this level for too long will make the NIFTY vulnerable once again to volatility and profit taking bouts. The levels of 10850 and 10895 will act as important resistance levels for Monday. Supports come in at 10780 and 10740 zones. The Relative Strength Index – RSI on the Daily Chart is 57.5545. It remains neutral showing no divergence against the price. The Daily MACD still remains bearish while trading below its signal line. No significant formation was observed on Candles. If we have a look at pattern analysis, NIFTY is still in a broad symmetrical triangle formation and is moving further into the apex. Also, in the process, it is continuing to vehemently resist to the falling trend line which joins the high of 11170 with the subsequent lower tops. Overall, if we analyze the broader picture, NIFTY did not correct significantly whenever it met with a pattern resistance. Instead, it chose to consolidate in a capped range with some amount of volatility ingrained in it. We may see this behavior of the NIFTY as its underlying strength. However, until a resistance is breached on the upside, it gets little speculative to anticipate a breakout unless few indicators point towards such anticipated breakouts. We still advice to exercise caution and keep exposures at modest levels. Shorts should be avoided and major directional call can be taken if the NIFTY moves past and closes above 10850-mark with conviction. Long positions were seen being build in JSW STEEL, TATA MOTORS, STATE BANK, TATA STEEL, VEDANTA, PFC, ITC SAIL, HDFC, ICICI BANK, BHARTI AIRTEL, NTPC and TV18 BROADCAST.